Children begin modeling on their own early on in toddlerhood as a natural part of exploring the world. Toddlers love to move and manipulate objects - stack blocks, dump baskets, hide toys. And when they get a material in their hands that changes form with manipulation - squishing food, scooping sand, patting mud pies - that’s modeling! What an amazing thing, to discover the potential of the hands. Preschool-aged children will play endlessly with simple modeling materials - think playdough, sand-and-water play, rolling and cutting cookie shapes, and painting with their fingers. These games begin to take on an imaginative quality as well - the child becomes a baker or a destructive monster perhaps. Sometime in the kindergarten years, children develop an interest in forming an image that they have in their mind. All great toys are used for this creative purpose, craft materials are very useful at this age, and modeling materials are especially wonderful for learning to manipulate a substance into a form. The children’s imaginations are far more developed than the skills of their hands so making even very simple forms can go a long way. And then with steady practice in the grades, those hand skills improve and modeling becomes an art form. Waldorf education has a strong focus on the arts for all grades and ages, not just as a separate subject but as a powerful teaching tool in every subject. Jean Miller at Waldorf-inspired learning has a wonderful article about the Seven Lively Arts here. 2-year-old Sierra was so proud of her beeswax duck! So would you like to give it a try? There are many wonderful materials for modeling with in nature and all around you! Each of these materials provides a different sensory experience. Some hold their shape better than others, but if you can work it and shape it with your hands, it's a modeling material. Modeling is a wonderful free-play activity for the early years and I encourage you to have modeling materials available often! Time outside gives your child many opportunities to play with sand, dirt, and water. You can easily make playdough at home together to have on hand for playtime (and homemade is so much lovelier and better-smelling than the commercial kind!). Salt dough is fun for projects like making ornaments (it will harden as it dries and keep its shape). A little ball of beeswax can be very soothing for a child to keep in hand while waiting at the dentist's office or riding in the car. Modeling can also be part of your weekly rhythm in kindergarten. Many families enjoy having a baking day and a modeling day each week. Bread-baking is such a lovely rhythmic activity for all ages. Kneading and shaping the dough is a perfect modeling activity for young children! On your modeling day, you could work with any number of materials, but beeswax is a favorite. Run, run, as fast as you can! You can't catch me, I'm the gingerbread man! Many parents have heard about beeswax modeling clay but they aren’t sure what to do with it or if it’s worth the expense. Or they’ve tried it and found it frustrating to work with. Does it make sense for you to use it at home? Well, I don’t believe in following any codified school plan in my homeschool, but I do believe in surrounding my little ones with beauty and warmth, trying new things with an open mind, and working towards understanding. Beeswax was not an instant hit for me but I'm so glad we made it part of our weekly rhythm in the kindergarten years. It really is beautiful and so lovely to work with - if you follow some basic steps. Beeswax modeling is a will-building activity - and so is learning new things as a homeschooling mama. I don’t always want to build my will, but then I’m always glad I did! :) Also, what I thought was a really expensive item turned out not to be because we used our original pack for over three years (so let’s see, I spent about $8 per year on a material that we used at least once a week in preschool, kindy, and first grade). 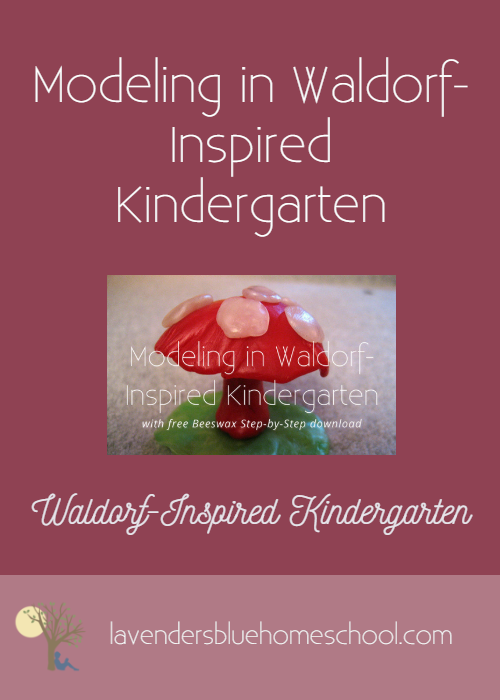 To provide you with lots of support for modeling in kindergarten, the Lavender's Blue Kindergarten Curriculum includes a video tutorial on modeling with beeswax and weekly modeling ideas to tie in with the stories and circles! Kindergarten is a wonderful time for process-oriented learning (not product-oriented). This is a time for exploration, sensory experience, open-ended creativity, and free imaginative play. Skill-building and lessons can wait. Enjoy the sensory experience of modeling - begin by exploring the material without making anything in particular. Be open to changes and surprises if what you’re making is different from what you imagined. You can download a free step-by-step guide to beeswax modeling below! Sign up Here for the Beeswax Step-by-Step Guide!